A humorous look at the creation process and just what went wrong. I'm reminded of the Gary Larson comic in God's kitchen, where God is sprinkling jerks onto Earth "just to make it interesting." 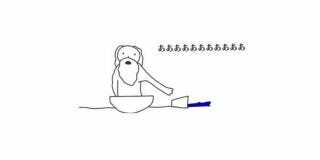 In Japan, the reason why some things are the way they are have been explained by a simple doodle depicting a kitchen mishap involving the Almighty, titled "When God Made." Some, or rather most of the pictures are very specific and inside jokey, but, if you understand the references, at the very least they'll make you smile. Maybe the Lord wasn't stoned when he created the platypus – maybe he just spilled some of the ingredients.